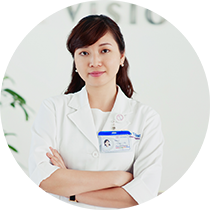 Dr. Nguyen Thi Hanh Dung is an ophthalmologist and Phaco surgeon at Cao Thang Eye Hospital. Prior to joining Cao Thang Dr. Dung worked at the Ho Chi Minh Eye Hospital, the District 8 Hospital and the District Go Vap Hospital. Dr. Hanh Dung obtained her medical degree from the Guang Xi Medical University, China in 2009. She then completed her Specialist Level 1 (equivalent to a Master of Ophthalmology) at Pham Ngoc Thach University of Medicine in Ho Chi Minh City. Dr. Hanh Dung also completed the Refraction course at the University of Medicine and Pharmacy in HCMC, as well as the Basic Phaco surgery course at Pham Ngoc Thach University of Medicine. Dr. Hanh Dung can speak English and Mandarin Chinese.